When it comes to buying drones online, there are many choices. When you own a drone, buying parts and accessories online gets easy as you can find most on Amazon. If you are looking to buy your first drone or going back into the market for a new drone, then the choice can be too much. At the moment the top companies for professional and consumer drones are DJI followed by Yuneec, Walkera, Parrot and Hubsan,. Drones which are fun come from Parrot, Walkera, Ehang, UDI, Hubsan and Cheerson to name a few. You can buy these drones online directly from many of the manufacturers website or from online retailers. In this article along with videos, we show you the best places to buy drones online. We list the best drones in categories such as professional filming, business, fun and racing. We also list the drones which have the latest autonomous flight modes, zoom cameras and collision avoidance. We also take a brief look at the features on some of these latest drones, which have top quality cameras to produce the very best aerial images and films. The prices for all these drones are also affordable for most people or business. There is some exceptional video below including 10 top tips to think about before buying a drone. It’s important to choose the right drone. Choose the correct drone and you will have plenty of great outdoor fun. You can also start an aerial drone business and there are many new and exciting opportunities in this sector. DJI are way ahead when it comes to drone innovation and sales of their drones. Next comes Yuneec and Walkera followed by Parrot. The Parrot drones are huge sellers and aim at a slightly different market. It’s a highly competitive market with some companies entering and then leaving. GoPro entered the market with their Karma drone. However, it didn’t have a good introduction and they have now left the market. 3DR had big investment but unfortunately 3DR have stopped producing their SOLO drone. 3DR will now concentrate on software and services. If you want a drone for the fun aspect such as acrobatics, racing and some filming, then you know need to spend a huge amount of money. You can buy some nice fun drones for €700 tops. There are so many but here is a list of some top fun drones. Owning a drone and getting outdoors is fun. While all of these drones are excellent, I want to give you an idea of what is possible and the type of drone innovation which is taking place. The Aibao is the latest drone from Walkera. The Walkera Aibao drone along with its software app allow you to play a virtual reality flight game in the real world. This is the 1st drone which allows the real world intertwine with the virtual world. You can take this drone out into an open space and play virtual reality flight and fight games in the space. The games give you Racing, Combat and Collection mode. Here is a short Aibao Game drone video. It sure is fun. Walkera manufacture some of the best racing drones and have a number of models out at the moment. Eachine and Arris has some really terrific racing drones also. Now these drones are not used in the Drone Racing League (DRL) as they use their own racing drone which is the same for every competitor. These drone are very portable. They are small and their arms fold in. These drones also have exceptional cameras and stabilization. These drones fit into more than 1 category. They are portable, fun and can film professionally. DJI Mavic Pro – Without doubt the Mavic is by far the easiest drone to fly. You can fly the Mavic with the remote control or mobile phone. You can also attach your cell phone to the remoter control and with the DJI Go 4 app, you can fly FPV. Flying with the remote control and DJI Go 4 app is an absolute dream. The Mavic flies beautifully smooth even in windy conditions. It also shoots suberb 4k footage also in windy conditions. It’s the one drone that people will still be talking about in 20 years time. These drones have 4k video cameras, top quality gimbals, the best stabilization quality and they output the very best quality of film and still photos. DJI Mavic Pro – This fold up drone is almost pocket sized. It can fly for 27 minutes and it hovers ultra stable both indoors and outdoors. It has collision avoidance sensors and a number of great autonomous flight modes. It can film in 4k video, take 12 megapixel stills. This is a terrific drone to film your adventures. Read more on the outstanding features of the DJI Mavi Pro here. If you want a drone that is more suited for aerial landscape filming then the next drones are perfect. DJI Phantom 4 Pro – This drone has so much new technology. It has collision avoidance, an exceptionally smooth integrated gimbal and 4k camera. It has many autonomous flight modes which will make filming extremely easy. Find out more about the Phantom 4 Pro Intelligent Flight Modes here. DJI Inspire 1 – This drone is more expensive and it is really a professional business drone. It has loads of integrated gimbal / camera options. It can also be adapted for thermal imaging with the Zenmuse XT gimbal. 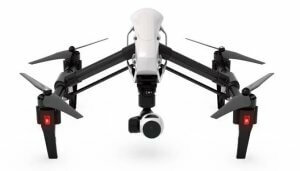 DJI Inspire 2 – Specifically designed to product Hollywood quality film. Integrated into the Inspire 2 is the brand new CineCore 2.0 image processing system, capable of recording 5.2K videos in CinemaDNG, Apple ProRes and more. Walkera Voyager 4 – This new drone has a very precise 3-axis gimbal stabilization and a 16x optical zoom HD camera with a 10 mm-1500 mm wide angle-telescopic lens. The below list are the latest drones which use various obstacle detection sensors allowing them to stop the drone from crashing. These drones have many autonomous flight modes and 4k stabilized cameras. They really are the best of the best. Most quadcopter will hover in front of an obstacle. Both the Mavic Air can detect obstacles and then fly around them. So can the Yuneec Typhoon H with RealSense. All of the above drones will capture tremendous landscape aerial footage. These drones also have many autonomous flight modes such as Follow Me, Circle Object, ActiveTrack, Points Of Interest, Waypoint which will allow you to film your aerial landscape, travel and sports adventures. If you want to start a drone business, then buying the right drone is essential. Below is just a couple of sectors where owning a drone could make a very worth wile business. Here is a link to some articles on the best uses for drones which covers many sectors. When buying a business drone you need to think about what type of business you will aim towards. Perhaps a great options would be to buy a drone that is adaptable and can be used for site surveying, lidar mapping, 3D photogrammetry and thermal imaging. Drones are presently being used for inspecting real estate, cathedrals, industrial factories, farms, archaeology sites, railway tracks, power lines and pipe lines. Wherever you see scaffolding being erected to inspect a building whether indoors or outdoors, a drone can do a much better job, far quicker and for a lot less money. A recent report from the Netherlands highlighted there were over 100 deaths from inspecting Telecoms masts alone. Drones such as the DJI Phantom 4 and many other can create 3D Photogrammetry maps with the onboard cameras and specialized 3D mapping software. Drones can also be mounted with LiDAR, Thermal and even Time-of-Flight sensors to really create totally new solutions and solve real world problems. Drones are being used in health and safety; search and rescue; accident investigations; insurance appraisals and crime prevention. Drones are been used to film scenes for movies and in the games industry. Many companies are using drones to create great videos to assist with their advertising and promotional work. You will start to see more aerial videos of hotels, resorts, golf courses and lake districts in the future. Property agencies are also starting to use drones to film both commercial and residential real estate. Both of the below drones can be used for professional filming, 3D photogrammetry and thermal imaging. These drones are more expensive but still within region. These drones produce the very best quality video and stills. They can carry heavier camera equipment and generally can be used with a number of different gimbals and matching cameras. Most drone manufacturers have their own online stores. However, some are better than others. DJI have an excellent store whereas some of the others are not so great. Buying from a website you can trust or have been with a long time is important. Also, feeling confident that the online store takes it website security and your personal details as the utmost of importance is critical to buying drones, gimbals and parts online. From my experience these are the best online storing for buying drones, gimbals, cameras, parts and accessories. Here is an excellent video with some 10 great tips which you need to consider before you buy a drone. Below I have some reviews of the best drones. These drones are easy to fly and allow you to film professional aerial video and stills. They are from top drone manufacturers with great technology and support. 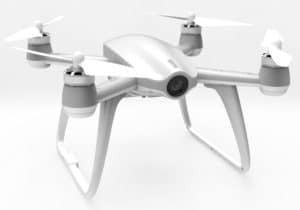 The DJI Inspire 1 quadcopter was released in November 2014. It is perfect for aerial photography and cinematography. The DJI Inspire 1 has the bet advanced flight system to date. It also has the most gimbal and camera options of any quadcopter on the market. The Inspire 1 can adaptable for 3D Imaging, Photogrammetry and Thermal Imaging. The gimbal on the Inspire 1 can be swapped out and the Zenmuse XT / Flir Thermal Sensor can be installed. This drone is simply awesome. Read the full DJI Inspire 1 review here. While the Phantom 4 Pro may look like previous models of Phantoms, this is where the similarities end. Just to briefly outline, the Phantom 4 Pro have more power, better handing; flies longer further and faster. It has an FPV range up to 5 km in high definition, which can also stream live to YouTube. There is a lot of ground breaking drone innovation in the Phantom 4 Pro. Enjoy this video on the top Ph4. Parrot Bebop Drone is an ultra-light drone with a full HD camera digitally stabilized on its 3-axis. The Bebop Drone is a super-high-tech leisure quadcopter with features of a professional one! Equipped with a 14 mega pixels camera, the Parrot Bebop Drone takes video and pictures of the world in a 180° field with remarkable image quality. The combination of numerous sensors gives it impressive stability and great maneuverability when piloting with a smartphone or a tablet. The use of the latest WiFi 802.11ac MIMO and of four ceramic antennas 2.4 GHz and 5 GHz ensures an unequaled reach. For extreme sensations, the Parrot Bebop Drone can be piloted with an optional controller compatible with FPV glasses. Here is the official Parrot Bebop release video. Below I have another video of some beautiful scenery filmed using the Bebop. So many great drones, it’s hard to choose. Think about what you want the drone for. Do you want to own a drone for fun as a hobby or to do some serious filming. Perhaps you’re thinking about your own aerial drone business where you really want the best drone. Own a fleet of drones and provide valuable assistance to companies with marketing or site surveying and much more.